There are endless solutions for your unique shade sail requirements adding functionality and style to your property. Outdoor living and entertaining is a part of the Australian lifestyle, however protection and comfort using a shade solution can only enhance this experience for you, family and friends. Shade sail designs can be as simple or complex as you like, taking into account area, posts and attachment points, colour and cost. When you ask us for a no obligation free quote, we come to your home, provide design suggestions along with fabric samples and colours and from your response, provide you with a quoted price to suit your budget. With our incredibly helpful staff, Shade Sails Sunshine Coast knows precisely how to safeguard your family from the elements with the best and most effective shade sails around. Our efficient, stunning shade sails can even assist in raising the value of your home. We pride ourselves on supplying the highest quality in products, service and customer satisfaction. 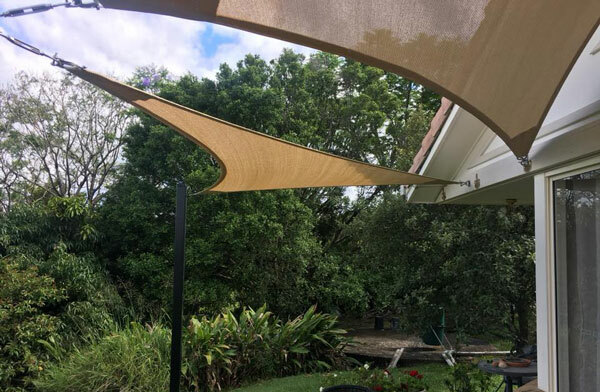 Shade Sails Sunshine Coast is a fully insured and licensed provider with all work carrying a comprehensive warranty and guarantee. Our shade sails are tailored to your specific needs and can be designed around your environment. Call and speak to one of our professional specialists today to discuss your requirements. I would like to receive the Free Twice-Yearly Australian Shade Newsletter for expert shade sails information. Unsubscribe at any time.